Mobile has a certain magic that keeps you on your toes. Where a melting pot of people, flavors, cultures, and traditions become one voice to lead all of life's celebrations. Join the jubilee and welcome every day with an enduring passion and a little soulful hospitality, because life is the ultimate gift. This is the spirit of living. This is what we're born to do. Funky, feisty and festive. Historic, hip and happening. Or colorful, cool and cultured. You can call this coastal town a lot of things when you have a vibrant 300-year history with lots of stories to tell and long-standing traditions celebrated on a regular basis. 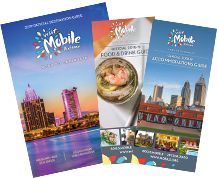 Once called the Paris of the South, Mobile has long been the cultural center of the Gulf Coast and you'll find an authentic experience like nowhere else in the southern United States.